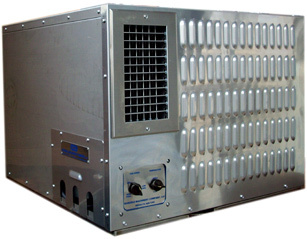 Aero Conditioner Company offers five basic models of through-the-wall (window) harsh-duty air conditioners ranging in cooling capacity from 12,000 BTUH (3.5 KW or 1 ton) through 36,000 BTUH (10.6 KW or 3 tons), when measured at an ambient (outdoor) temperature of 131°F (55°C). Aero Conditioner Company rates these capacities at and designs the air conditioners for ambient temperatures of 131°F (55°C), not the normal rating temperatures of 95°F (35°C) used by most manufacturers. Since Aero’s patented design assures that air conditioners will maintain their full cooling capacities at lower temperatures without fan speed or other active controls, we assure that units can deliver the promised cooling throughout the year in your facilities. Through-the-wall air conditioners can be mounted through a window, but they generally weigh more than window units because they are more robust and, therefore, require more support. Aero Conditioner Company offers optional 316L stainless-steel support brackets for its TTW air conditioners, however, ACC’s special Flange Mounting enable users to in shell the units from the inside and any outside support. Aero Conditioner Company through-the-wall air conditioners have all key components mounted on a slide-in insert so that they can be removed for maintenance and repair and remounted quickly. **Some units can be used with 200-220/50/1 current at reduced capacity without modification. They can also be modified for use at 220-240/50/1 and/or to maintain full rate capacity at 50Hz. Many other electrical configurations upon request.